True Tulip & Banded Tulip, 2-28-15, Cayo Costa Island, SeaShell News & Shelling. SeaShell News, 2-28-15, True Tulip & Banded Tulip, Shelling, Cayo Costa Island. A nice True Tulip and a Banded Tulip from shelling on Cayo Costa Island. “The tulip shell has a fusiform outline, with an overall smooth surface, and presents fine growth lines, and small denticles on the inner edge of its delicate outer lip. It is whitish to tan in color, with rows of darker brownish blotches of various sizes. Over the blotches are symmetrical rows of thin lines which spiral along the whorls of the shell, which are normally about 9 in number. The shell of an adult tulip snail can be from 2.5” to 9.5” inches (6.4 – 24.1 cm) in length.” Source: True Tulip. 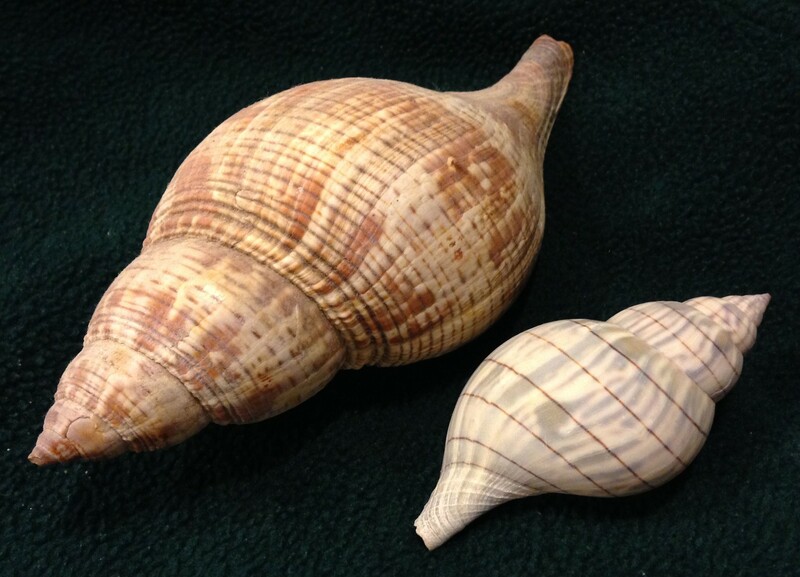 “The banded tulip shell does not grow as large as that of the true tulip, Fasciolaria tulipa. Also the color pattern is different: the color splotches appear as a redder color (blue in rare areas) and the stripes that give the banded tulip its name are much farther apart. The shell grows to be 2 ¼ – 4 1/8 inches (5.7-10.5 cm) in length.” Source: Banded Tulip.